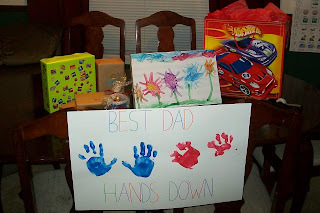 The "best dad hands down" poster idea came from a shirt we saw at the store. Dawson's hand prints turned out very well, but I obviously had a hard time getting Brady's hand prints. Dawson loves wrapping and decorating presents. 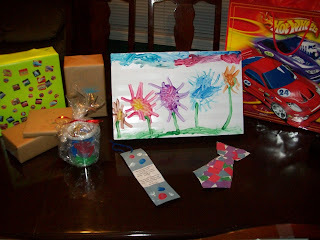 He used markers, stamps, stickers, and even painted a box for Randy. The painted box is my favorite!! Those are flowers with green grass and a blue sky - so beautiful! Dawson also made some Father's Day crafts this year - a tie with pieces of construction paper glued on, bookmark with a poem and fingerprints, and a cup he decorated and assembled at library story hour.